You may be worried about Windows 10 phoning home to Microsoft. Don't. Microsoft is absolutely clueless about what to do with the data. 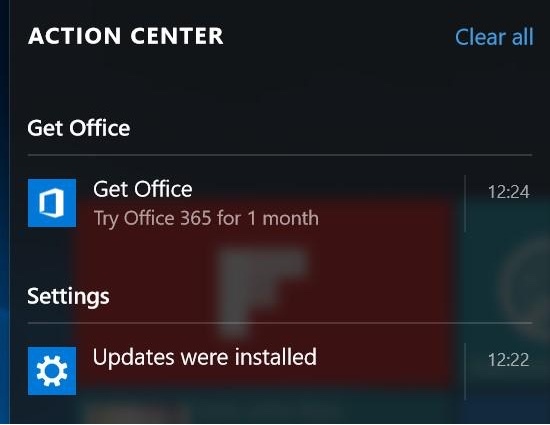 With every update it keeps installing the "Get Office" crapware and sends a message into my action center about getting a free month of Office 365. And here is the deal: I already have Office 365 and I am logged into Office 365 on this very machine. I do not see this behaviour on any of my machines (four in the meantime...). Not seeing any of that here either. I would suspect that you've disabled parts of Windows 10 that would clue Microsoft in to your set up.